Plastic surgery is a very creative specialty, which builds on the fundamentals of many different surgical fields. One day you are operating on a child with a congenital anomaly and the next day you are operating on a fractured lower leg needing a tissue transplant for coverage. The scope is huge and requires a number of varied skills. If you ask five plastic surgeons how to solve a problem you frequently end up with five different answers, all of which are viable and frequently evidence based. The wide scope and variability in plastic surgery mean that no two days are the same and no two operations are the same, which always keeps me on my feet!! I really enjoy the technical skill and problem-solving aspects of plastic surgery. Together, these provide me with a steady stream of satisfied patients, which I find very rewarding. Mr.Allan Wilson (General/Vascular Surgeon): An extremely bright and humble surgeon who was a technical wizard, with the ability to operate anywhere in the body effortlessly while involving medical students and staff in order to both teach and inspire them!! I am most proud of my research and fellowships in the USA. I spent nearly 3 years carrying out research both at New York University (NYU) and Stanford University, California and completed a groundbreaking project using tissues that we routinely transplant as vehicles for therapeutic protein production, facilitated by genetic engineering techniques. I was awarded the James Barrett Brown Award (Best Plastic Surgery Paper), the Clifford C Snyder award (Plastic Surgery Research Council) as well as an AO Research Foundation Grant and an American College of Surgeons – Research Fellow award. I subsequently spent a year at MD Anderson Cancer Center in Houston Texas where I carried out a microvascular fellowship. Only one foreign trainee is accepted onto the programme each year and this hospital carries out more tissue transplants (relating to microvascular reconstruction) then any other institution in the world. I would love to be a Chef in a Michelin star restaurant for a day… it would be interesting to see which job is the more stressful of the two!! I am most excited about advances in genetic engineering and their applications in medicine, ranging from the treatment of X-Linked SCID (Severe Combined Immune Deficiency) and CLL (Chronic Lymphocytic Leukaemia) and recently to the possibility of treating patients with haemophilia. If progress continues then the applications can spread to specific areas within plastic/reconstructive surgery, which was the basis of my research project in the USA and lead to my research MD from the University of London. 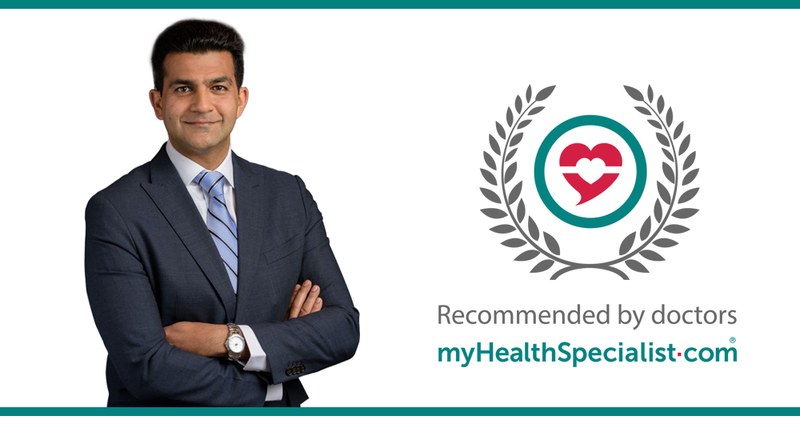 myHealthSpecialist.com. Was there ever any doubt! !